Subsurface 3D-Radar Survey to Locate and Map Utilities at Brooklyn Army Terminal - Infrasense Inc.
Infrasense completed a project using a ground-coupled vehicle-mounted 3D ground penetrating radar (GPR) system manufactured by 3D-Radar to identify subsurface structural objects that would impede future installation of sheet pile walls at the Brooklyn Army Terminal. 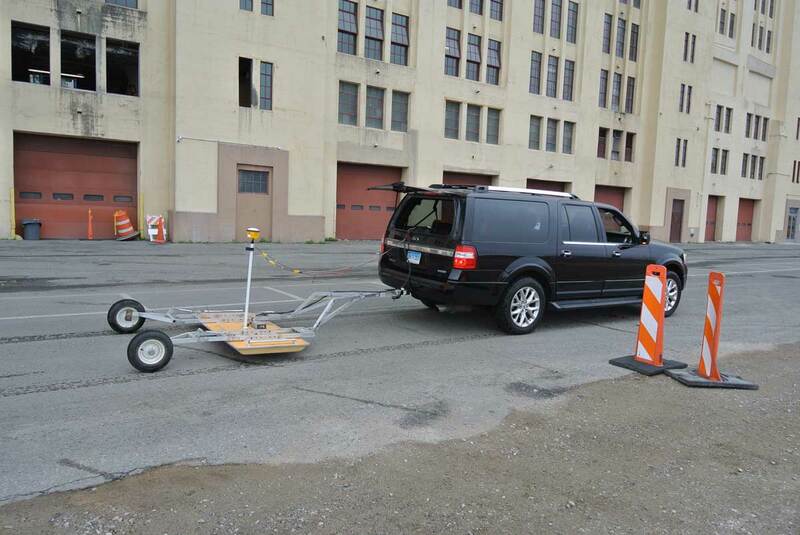 Using the trailer-mounted 3D-Radar step frequency array system reduced the data collection time significantly and provided an excellent combination of resolution and depth of penetration. 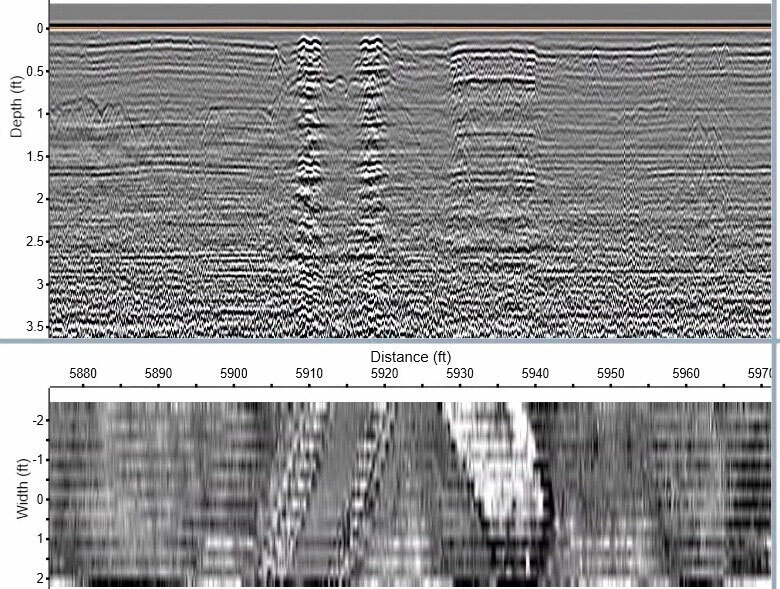 Using traditional GPR setups to obtain this type of data would require multiple surveys using different frequencies of antennas, adding even more time to the data collection process. The 3D-Radar system uses a 21-antenna array to obtain different frequency data from 300MHz to 3GHz, and image the subsurface in 3 dimensions. High precision GPS was integrated into the data collection system in order to combine adjacent lines of data and map common subsurface features accurately. 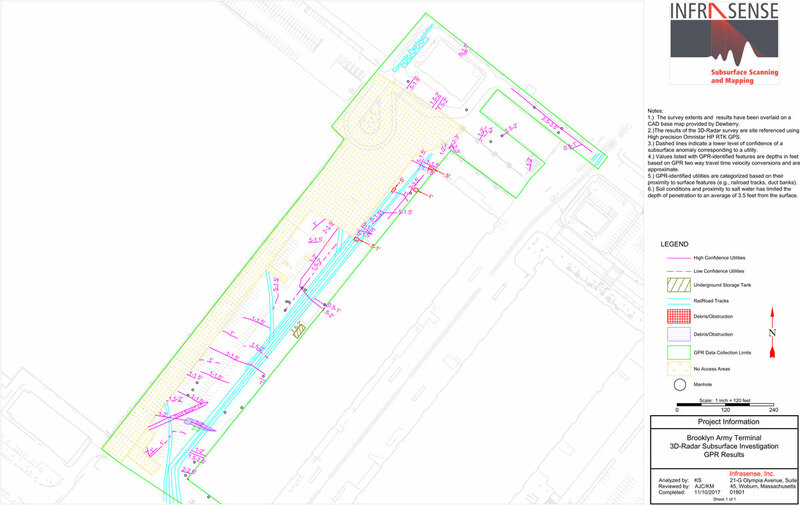 Final utility maps were provided as plan-view drawings and in CAD-compatible format. These utility map deliverables included locations of utilities, underground storage tanks, obstructions, and structural components possibly related to building foundations. Infrasense also discovered a series of railroad tracks that were thought to have been removed in the past, but instead were left in place and paved over with asphalt.